Reverend Clay believes the answer to his prayers involves his listeners writing a check to keep the Reverend Randall Clay Prayer Hour on the air. Did God tell him that Sarita Jo Franklin was listening to his voice over nine hundred miles away, or was it just a wild dart that hit its mark? Sarita Jo thought that making a donation to the “Prayer Hour” was just what she needed. Her reasons for her gift may be different than what you might imagine. If you chose to read Anahuac, you can draw your own conclusion. I’m writing novels these days that I hope make you ask questions about the characters’ motivations and about your own. The answer to the question “What do I need?” is as varied as the number of people on the face of the earth. It is surprising how many times our troubles start when the needs of our loved ones or co-workers don’t jive with ours. We learn quickly in this world to negotiate with others for what we think we need. My mother claimed that as a two year old, I would quickly eat my ice cream and look at her with doleful eyes and say, “You don’t want all of your ice cream?” Was young William genuinely interested in his mother’s needs or simply practicing his skills to become a radio evangelist? The preceding example needs no deep analysis, but in my case I didn’t go into radio religion, although some might say that becoming a lawyer was pretty close. In 1986, Robert Fulgrum wrote a book called, All I Needed to Know I Learned in Kindergarten. Fulgrum’s hypothesis was that things like sharing, being kind to one another and cleaning up after ourselves would be an excellent way for adults to act, not just kindergarteners. I suspect that one of the biggest blunders we make is to hide our needs from each other. No one around you can divine your needs, unless perhaps they are Reverend Clay. The bottom line of this is best summed up in something I heard years ago and has stuck with me. On first hearing I thought the statement was ludicrous. In my more mature years I have come to embrace it, but still struggle to practice it. Ask for what you want (need), listen to the answer and celebrate the noes. I encourage you to take some time to digest this statement that might seem crazy to many of you. I can hear myself long ago saying, “But I don’t want to be told no.” Many times when my life becomes complicated, I can trace it back to my failure to communicate my perceived needs. Breezing through life with illusions that others share your needs is a prescription for conflict and disappointment. Being told “no” frees you to see the world as it exists, not as you wish it were. Staying in the moment is indeed hard when the “moment” is painful. The alternative is even more painful. Now my needs are that you to go reread the statement again. I promise you it might help you. https://williamddarling.com/wp-content/uploads/2017/07/AnahuacLogo-300x75.jpg 0 0 William https://williamddarling.com/wp-content/uploads/2017/07/AnahuacLogo-300x75.jpg William2018-02-25 20:02:102019-02-25 07:12:56Do You Have What You Need? Bad Boy Books in San Marcos is hosting a book signing event on Thursday, February 22 at 7:00 pm. This is a great place and will be a fun evening. Click on Thursday above and check out the book store and gallery. I hope you will join us. Murder by The Book, an iconic independent book store in River Oaks in Houston, hosted a reading and book signing event on Saturday afternoon. The staff at the store was extremely professional and courteous. We tried something different for the reading portion of the event. Anahuac is recorded for an audio book and we are waiting for the final editing to be completed. We had some chapters available so we played a short excerpt from the audio. As I have said before, the audio book is something new to me. Alan Adelberg, our narrator, brings the characters to life. I am way behind those of you who are old hands at listening to audio books. I liked the way it worked. 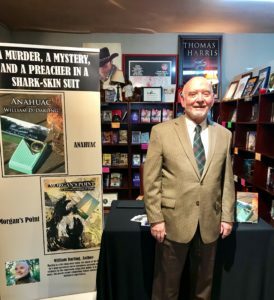 I will be doing a book event in San Marcos at Bad Boy Books on Thursday February 22 at 7 in the evening. I am looking forward to playing another excerpt from the audio book then. Old friends Ivan and Margaret Ann Wood joined us for the signing in Houston and it is always fun to see friends at these events. We had dinner with another old friend, Ray Wright. We had breakfast this morning with Harry Wilbanks and his wife Ann. 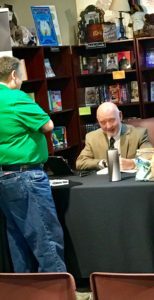 Book signings are a way to get out and meet people and promote your books. It is also a great way to catch up with old friends. Be watching your local book store. You never know where you might find me. Picture of an Anahuac sign. SOME DAYS in our lives represent the end and the beginning of something. Today is one of those days for me. Over the past three weeks we have been in Joel Block’s studio (The Block House) in Austin, Texas recording my latest novel Anahuac as an audio book. Today we will wrap up the recording. 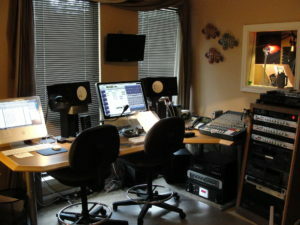 The process of recording an audio book began for me with the selection of a recording studio and a producer. Joel Block was recommended to me by a knowledgeable author and was the perfect choice. Kind, patient, talented and professional are all words that come easily when I think of Joel. I would have been lost without his help. Joel called for auditions from his list of vocal talents. Choosing a talent to read a novel is not as easy as you might think. We listened to at least ten audition tapes and pared the list to three. Those folks were kind enough to record an additional audition and from them we selected Alan Adelberg. Alan is a true professional who has brought life to the characters of Anahuac. Courtesy of The Block House Audio Studio. “Hearing” a book is a new thing for me. “Old school” describes me best. I want to hold the book in my hand. After listening to Alan, I have a new perspective. Audio books are not exactly like the old-time radio drama. First of all, there is only a narrator. 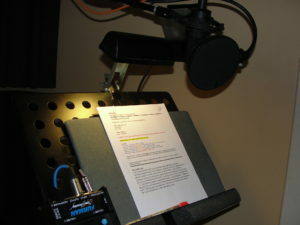 The narrator must use nuanced voices to distinguish between speakers. The dialogue in Anahuac is sometimes fast and furious. Using subtle, but clear voices to let the listener know who is speaking is a talent and I mean a real talent. Alan has exceeded my wildest expectations. After the first session I felt like several people must be coming out of the recording booth when he finished. Here is a secret I didn’t know. I assumed that an audio book was read straight through without any breaks. In fact it is not possible to do that. There are pauses, unwelcome breath sounds and other interruptions that are deleted by Joel. The finished product is seamless. Joel has shared a few chapters with me to let me hear what the audio book will be. It is amazing. There was another side benefit to recording the novel. I have been sitting with Joel with my face buried in a book I swore I couldn’t read again as we recorded it line by line. The process is slower than I could imagine and it has given me a deeper understanding of what I wrote. Sometimes I hear things that I didn’t fully understand myself while I was writing. I believe writing is more about learning to listen to something or someone unseen than being personally brilliant. 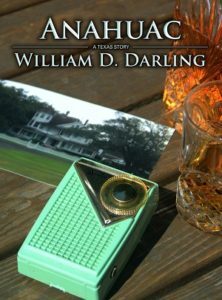 I am thrilled to say that within a short time Joel will have the audio recording produced and you can travel to Anahuac in a different manner than reading the book. Consider traveling to Anahuac with an audio rendition. It will be fun.